Now don’t ask us why SteelSeries named one of their most recent releases as the Siberia Neckband headset – perhaps Siberia, being where it is geographically, is so cold, hence the need for a neckband at all times to keep yourself warm, was the main reason on why they called it so? Targeting both music lovers as well as mobile gamers with this model, it will see action with all iPods, iPhones and iPads to boot – courtesy of its 3.5mm jack that caters for combined audio and voice and an in-line remote which powers both audio and call controls. The Neckband itself will come with thick, cloth covered foam earcups, an optimized soundscape, and a retractable microphone system that can be used while answering calls or stored in the left earcup whenever you’re just using it for your music listening pleasure. Well, it does sound as though it will keep your ears warm, doesn’t it? Since SteelSeries as a company places plenty of emphasis on delivering the best kind of gaming hardware to the masses, as they do not want you to have the excuse that you lost because of inferior hardware, you can certainly expect the Siberia Neckband headset to be quite the performer. 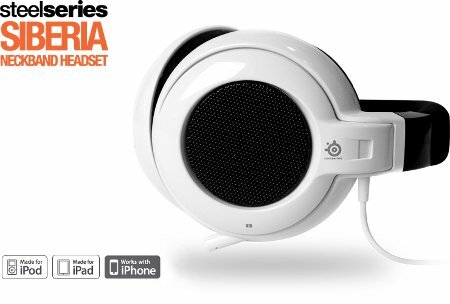 Having seen action throughout international music videos, the Siberia Neckband has long been considered to be one of SteelSeries’ most unique designs. The headset itself will rest behind the head on the user’s neck while providing excellent sound reproduction that has been fine-tuned with the help of professional musicians, DJ’s and audiophiles. It can be adjusted to fit all head sizes through its retracting neckband, while the unidirectional, retractable microphone can be stored in the left earcup and can be easily pulled out when answering calls. Its optimized soundscape emphasizes crisp highs, and deep balanced bass levels for music and movies.